These kids all look so thrilled, don't they? This ad for the President (Nixon's) Physical Fitness Award program got comics readers' attention back in 1969 by including Robin, Superboy(with his Kurt Russell haircut) and Supergirl(with an attitude apparently). The kid with the giant is obviously the biblical David. The poor guy stuck hanging on the vine for the photo shoot can't be Tarzan so who is he? "Boy?" Korak? Bomba? 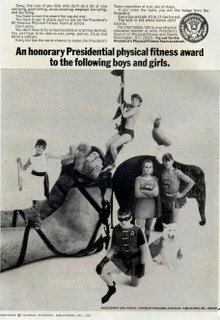 What about the boy with the elephant? A Kipling character? Kim maybe? The text refers to "elephant trampling." Huh??!! And what's the deal with Krypto? Does he get the President's award too? Aw, c'mon, we all know he'd probably bite the #$@!! out of Nixon. 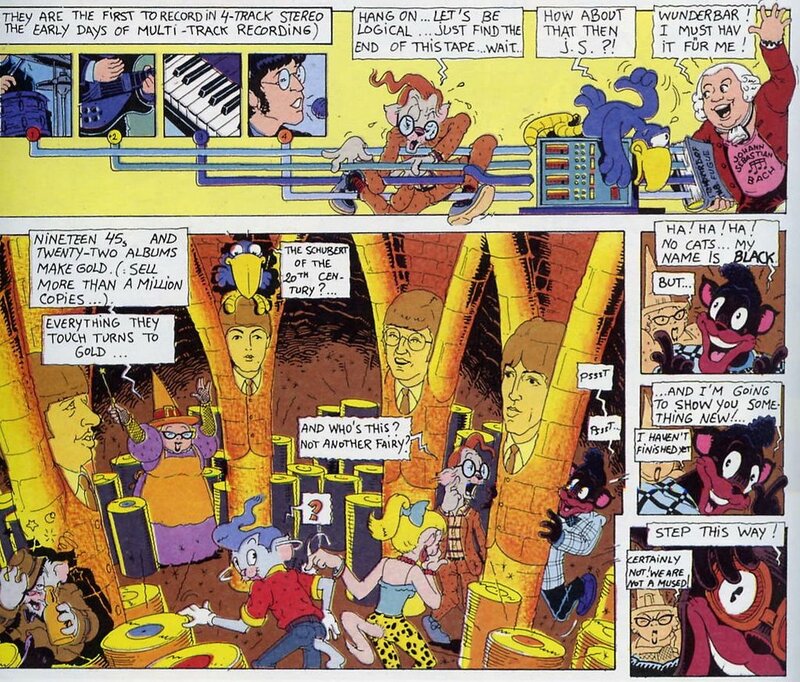 Just a little MAD-style cartoon of Swampy from a 1985 issue of the British fanzine, ARKEN SWORD. Paul Duncan's mag was THE fan source for all British comics info at that time and, anglophile that I am, I was regularly following 2000AD as well as Alan Moore's redefining of DC's SWAMP THING. This cartoon by Mike Matthews appears on the inside back cover of issue 15 and is presented here for good ol' Mike Sterling of Mike Sterling's Progressive Ruin. 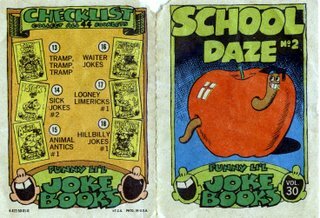 Here's a little school joke book from the mid-sixties drawn by Wally Wood with, I believe, the assistance of Bhob Stewart. As you can see from the back cover, there were 44 of these in all and obviously many were not by Wood. I don't recognize the art style in the others shown here. 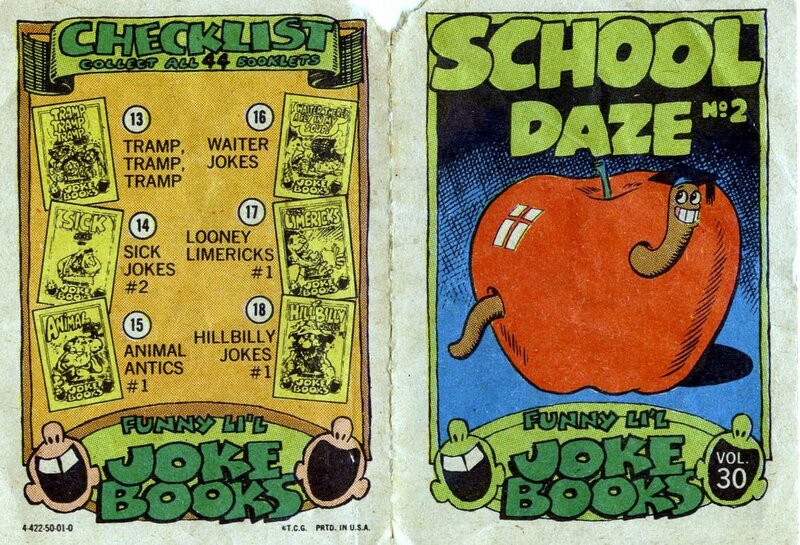 If these were from Topps though, as I believe they were, I'm pretty sure Art Spiegelman was there at the time and probably contributed. 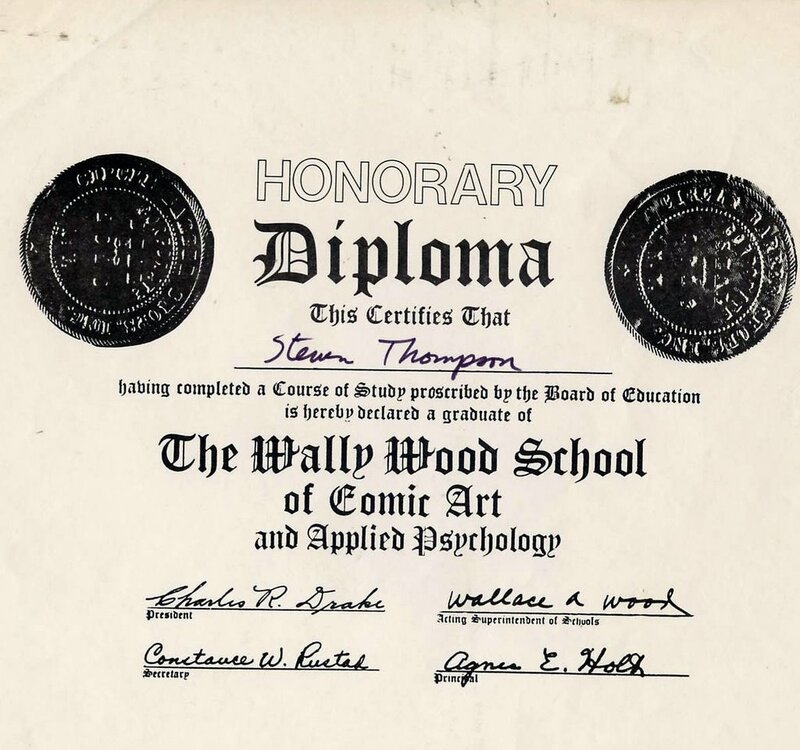 Since these are, after all, SCHOOL jokes, I thought this might also be a good place to run my cherished honorary diploma from the Wally Wood School of Comic Art and Applied Psychology. According to legend, Woody gave these out to all of his many assistants over the years. 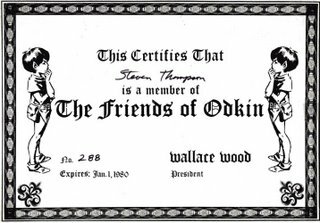 When, in a last ditch attempt at creative freedom, he started his latter-day fan club, The Friends of Odkin, in 1979 he signed and sent along one of these with all of the initial member packages. The real attraction to the package, as we've discussed before here, was a free Wood sketch of either Odkin, Sally Forth or Nudine. 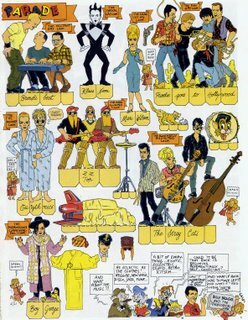 A recent email from Wood's one-time assistant Paul Kirchner (thanks, Paul!) confirmed my long-time suspicion that it was he, in fact, who actually drew them, paid $2.00 each by Wood to trace an original sketch. Sigh. Wally's demons were fast creeping in at that point. 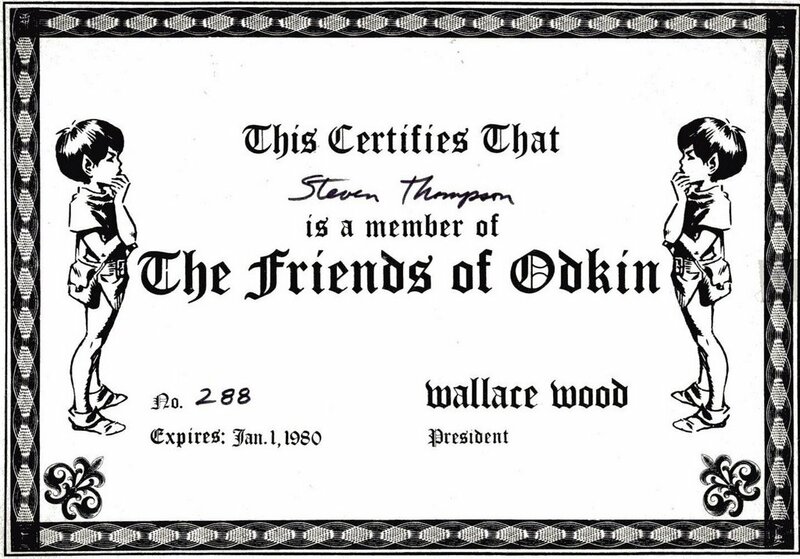 Anyway, as you can see, I was Friend Of Odkin # 288. One of my first email addresses was "Odkin" and a later one was "NewOdkin." Once a friend of Odkin, always a friend of Odkin, I guess. 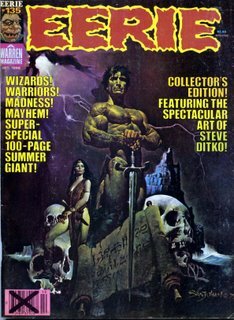 Beneath the heroic Sanjulian cover (which has virtually nothing to do with what's inside)of this 1982 issue of EERIE you will find no less than ten quality horror and fantasy stories all written by the late, lamented Archie Goodwin and all drawn by the legendarySteve Ditko. By this time, the Warren magazines were spending a lot of time feasting on their own histories. All of these are reprints from previous issues dating back as far as the late sixties but the art is some of Ditko’s best ever. Using a variety of styles he rarely got the chance to use anywhere else, Spider-Man’s co-creator demonstrates a range undetectable in most of his work. 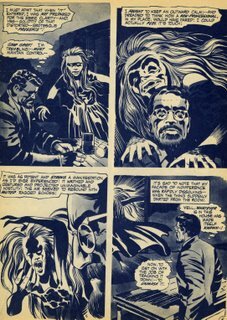 Having cut his teeth on Stan Lee’s short monster stories (as well as a ton of similar Charlton shorts), his creative storytelling techniques for these 6 page wonders is a joy to behold. Running the gamut from werewolves and mad scientists to wizards and warriors, the artist’s vaunted imagination is allowed free reign, resulting in some incredibly atmospheric scenes as well as some nightmarish images that take his Doctor Strange dimensions a step further. 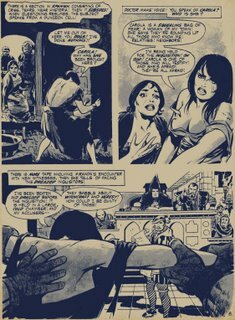 His use of wash is unexpectedly atmospheric and his layout and inking are stronger in most of these pieces than in anything seen from him since. You can almost feel his enthusiasm for some of these pieces. 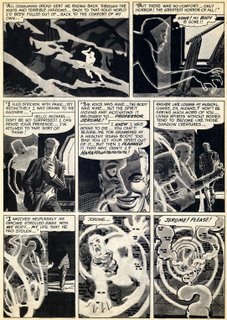 Nothing incredibly original in the plots but Goodwin’s writing is as sharp as ever and Ditko’s art zooms you along at just the right pace for each one. If you’re at all a fan of the mysterious comic genius that is Ditko, you owe it to yourself to seek out EERIE #135. 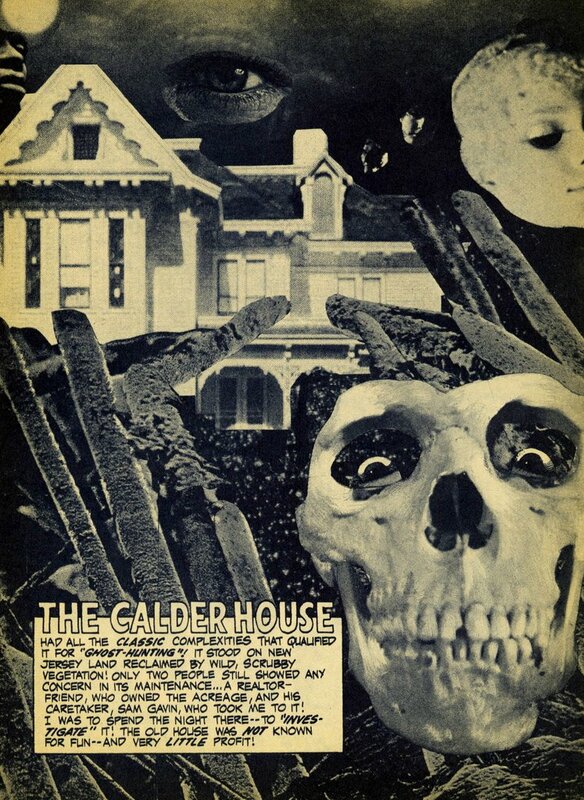 People tend top forget just how amazingly freakin' popular DARK SHADOWS was circa 1970. It may have been more than a little cheap looking, with no time for retakes no matter what prop fell but it was beloved. 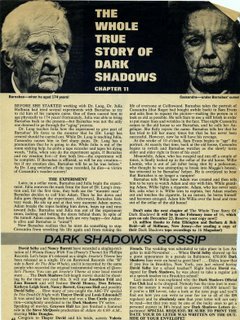 DARK SHADOWS was cover-featured on local TV mags, the stars appeared regularly on talk shows (and kids shows), the soundtrack album hit the charts, it was prominently featured in FAMOUS MONSTERS but also in SIXTEEN which had a running feature recapping the series entitled THE WHOLE TRUE STORY OF DARK SHADOWS. 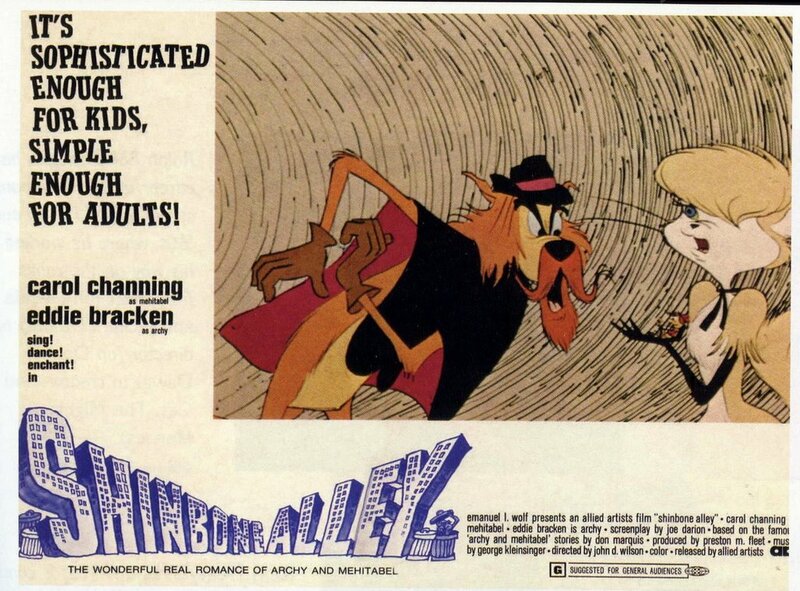 Kids loved it, adults loved it and let's face it, you aren't going to find AS THE WORLD TURNS-THE MOVIE in Maltin or on IMDB but there are the two DS movies. 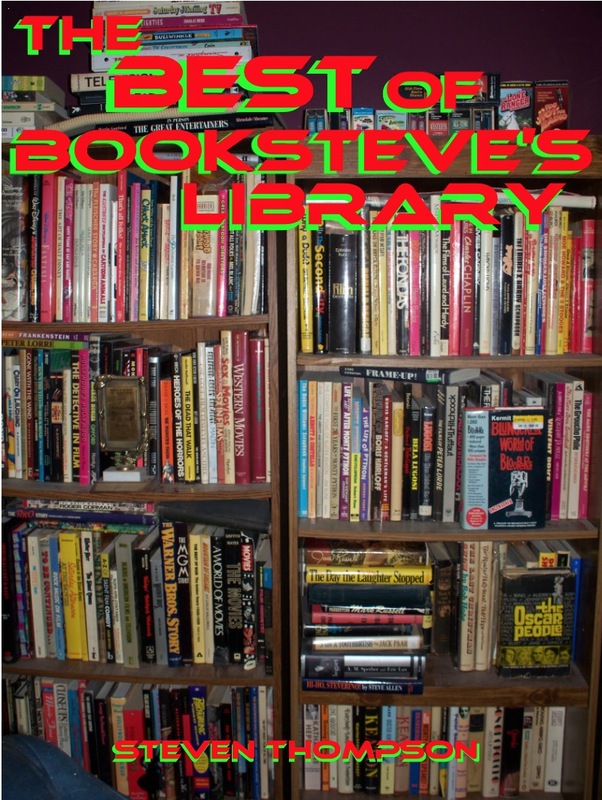 In its afterlife, it spawned an industry of spin-off books, tapes, CDs and conventions. 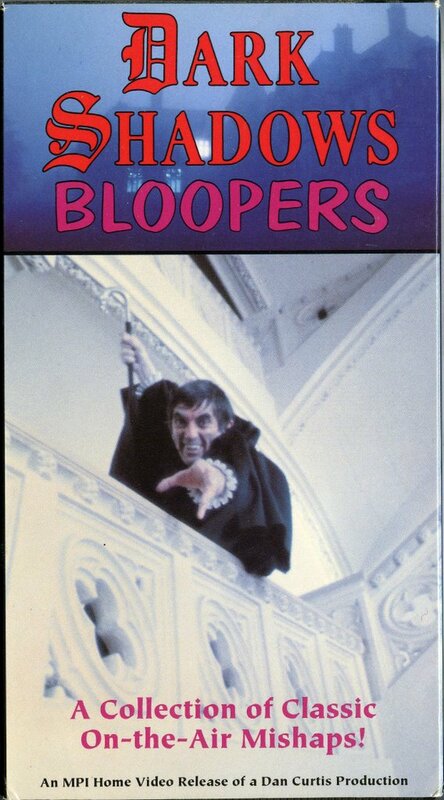 It was even one of the very first series to have its entire run committed to video (although in those pre-DVD days, that meant 200 plus tapes!!). Even the remake series has spawned a cult! 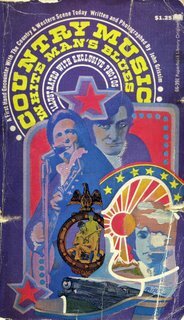 All of this came originally from the brain of DARK SHADOWS creator Dan Curtis who has now left us as so many of my childhood heroes have done in recent years. 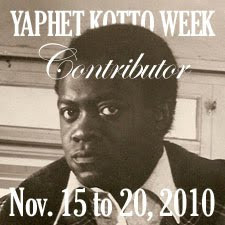 Curtis wasn't a prolific producer but all of his productions were memorable and bore a unique quality in their style (and musical scores) that made them fairly easy to identify. 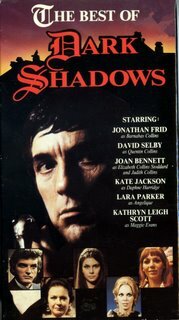 Still, the original DARK SHADOWS, although diminished now to cult status, is his most memorable legacy. Of the stars on the series, Jonathan Frid went on to star in Oliver Stone's first feature film, SEIZURE, before fading into the show business background. David Selby got a shot starring in THE SUPER COPS, then hung on in a few more films and on TV himself. Lara Parker worked steadily for awhile in films and TV and Kate Jackson went on to considerable fame as Charlie's "smart" angel among other successes. Kathryn Leigh Scott started Pomegranate Press (and once sent me a hand-written rejection note for my book proposal! ), Louis Edmonds prospered on a real soap opera, Dennis Patrick worked as a busy character actor as did Thayer David, Roger Davis worked as an announcer and later TV star before taking up real estate and John Karlen, who overacted shamelessly as Willie Loomis on DS, won at least one Emmy Award for CAGNEY AND LACEY. 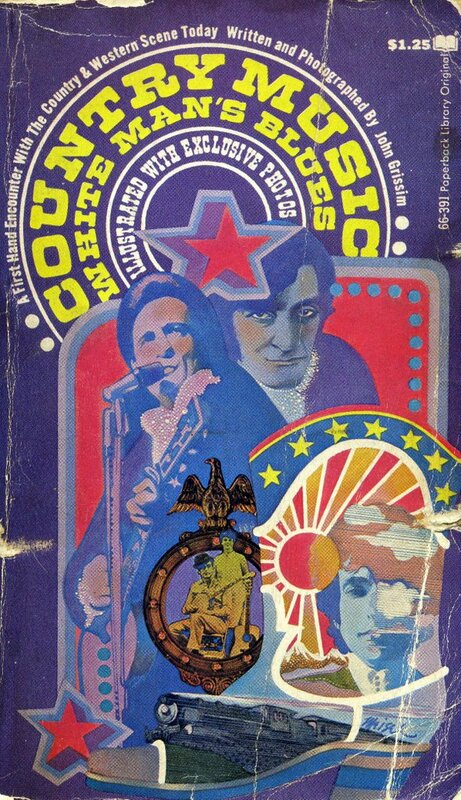 It's thanks to Dan Curtis that we got to know all of those people. It's thanks to Dan Curtis that one of my greatest childhood memories is hurrying home (or more likely to my 5th grade girlfriend's house which was closer) to enjoy DARK SHADOWS. 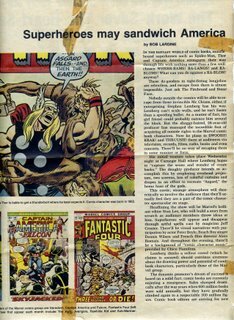 I hesitate to write too much here about the great and legendary comic book King, Jack Kirby,as his life and work is already being obsessively documented in magazines and on the Net. 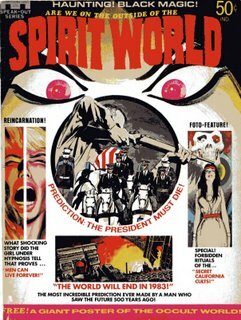 Over the weekend, however, I came across this little footnote, Kirby's SPIRIT WORLD, a 1971 DC magazine whose genesis can be found in great detail here:TwoMorrows Publishing - Spirit World - Kirby Collector Thirteenth Issue. I got this and its equally Kirby companion IN THE DAYS OF THE MOB at Woolworths of all places that year and it was obvious that Jack was enthusiastic about both of them. 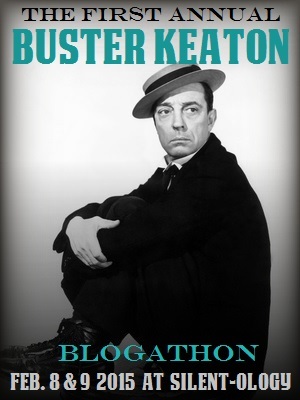 For one thing, he was once again stretching the format, attempting graphic stories to compete with the detective story, romance and supernatural mags that were all the rage at the time. Kirby's infamous collages appear often but with much better reproduction than those in the comics. 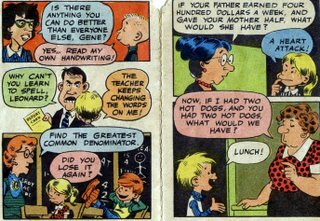 The inking by the much-maligned Vince Colletta here seems less rushed than usual and helps smooth out Jack's rough edges. 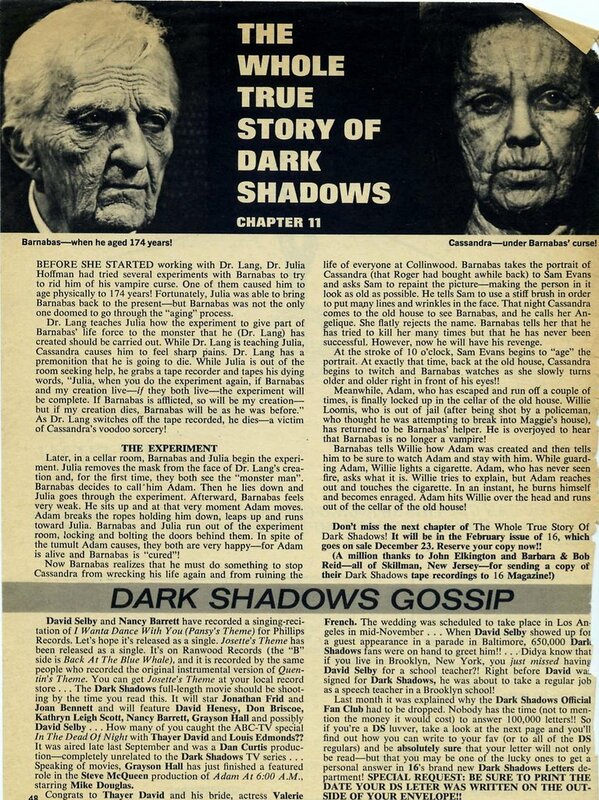 The stories, hosted by the Doctor Graves-like E. Leopold Maas (Seriously, is that the best name they could come up with? I mean, this is the guy who gave us Vermin Vundabar, Funky Flashman and Granny Goodness!) are typically over-the-top but the whole thing really did seem to me at that moment in time to be a departure...a next step...which of course meant DC quickly quashed the whole concept of "adult" mags just as they would soon do with the whole "fourth world" series. Sigh. 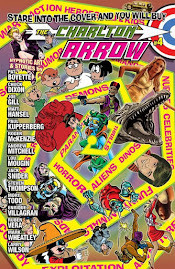 Steve Sherman and everybody's favorite blogger Mark Evanier co-edited and even wrote and photographed the fumetti story herein. Additional stories intended for SPIRIT WORLD 2 ended up eventually in the color comic WEIRD MYSTERIES. Here are a few bits from the one and only issue. 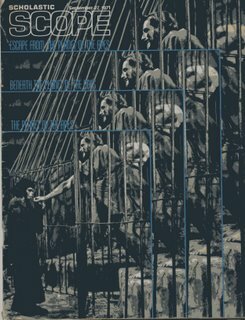 Here’s a graphic novel I’m betting most of you have never seen. 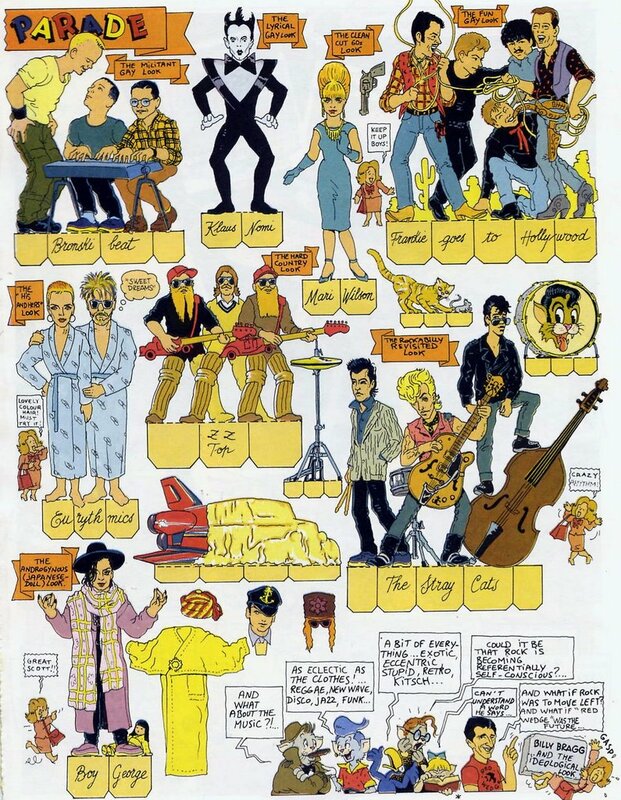 ROCK TOONS was released by Harmony Books in 1986 but only through the bookstore market (and then just barely), not through comics shops at all. In 101 pages, this French graphic novel masterfully weaves the colorful tale of the complete history of rock & roll music as told through the eyes of several funny animal cat researchers. Nearly every aspect, big and small, is at least touched on as the cats attempt to weave the disparate threads together and keep it all within the context of the times. 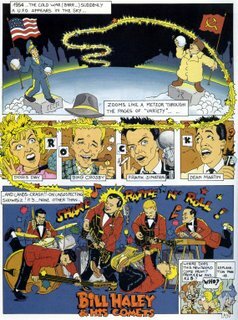 From Chuck Berry to the Beatles to Culture Club, from rockabilly to teen idols to punk, the creators do a fine job of offering the story itself while also, at times, satirizing it. Who are these creators? Well, the underground-like art (including two black and white Crumb tribute pages) is by one Serge Dutfoy and pre-sages Justin Green’s later MUSICAL LEGENDS pages. 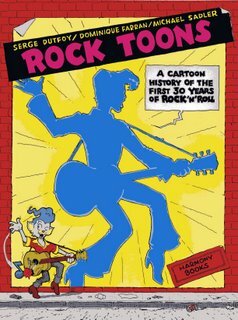 Written by Dominique Farran and Michael Sadler (who’s also credited with the excellent English translation) ROCK TOONS is funny, inventively drawn and most of all, more educational on its subject than many far weightier tomes written by overblown rock critics (who shall remain nameless but you probably know who I mean). The reason that most of you have probably never seen it, however, is that the chain bookstores at the time apparently didn’t purchase it at all…until it turned up remaindered a few years later at Waldenbooks for 1.99 which is where I got my copy. A quick check of the ‘Net shows available copies from 99 cents to 19.95. I think it’s an undiscovered gem at either price. Rock on, cats! 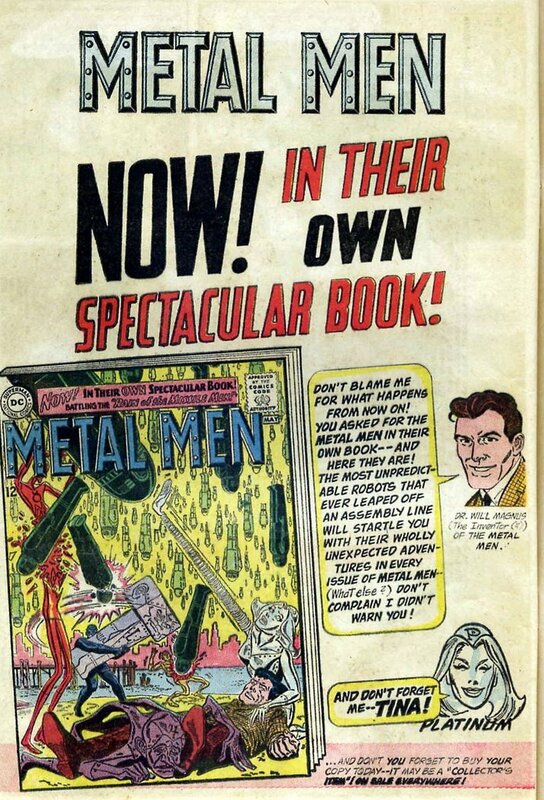 Here's a 1963 ad from WORLD'S FINEST #133 promoting the first issue of the METAL MEN in their own mag (after a few SHOWCASE tryouts). A few years ago I decided to re-collect METAL MEN since it was A)cleverly written, B)professionally drawn, C)filled with bizarrely fascinating characters and even D)educational. Besides all that, my wife really liked the book, too. 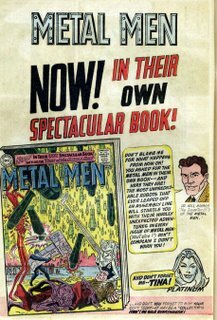 Unfortunately, re-collecting METAL MEN was cost-prohibitive as I apparently hadn't realized just what a cult the book has for itself! Thus we find ourselves in the age of DC SHOWCASE in which all things suddenly seem possible in terms of reprints. Why, you could just about do the whole run in two of those 500 page volumes and throw in all of those BRAVE & BOLD team-ups with Batman and maybe the Walt Simonson revival to round out a third! Heck, they started this series with METAMORPHO, they have SO got to have METAL MEN in the planning stages! Now we just need to get that grassroots movement for SUGAR & SPIKE to pick up speed! Contrary to popular belief, just because I live in Kentucky doesn't mean I'm a big country music fan. In fact, I only have one book on country music in my entire collection (seen here). I did really like Buck Owens, though. As a child, his song TIGER BY THE TAIL was a radio favorite. Buck was born in Texas and pioneered what was called the "Bakersfield Sound" rather than the traditional Nashville style of country. I guess that's where the "Western" part of "Country and Western" music fits in. 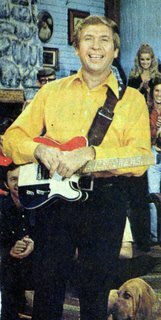 When HEE HAW premiered on TV with Buck as co-host, I laughed at the intentionally corny jokes but I was really waiting for Buck and his Buckaroos to get one of their straight musical segments. After the show went off the air (after what seemed like decades!) I often wondered why the stars, including Buck, were so infrequently seen. Buck apparently took his sizable paychecks into real estate and other investments, eventually buying his own entertainment complex where he reportedly performed a great show just last night! Buck died today at age 76. "Where, Oh where are you tonight? Why did you leave me here all alone...?" Thanks, Buck. We'll miss ya! 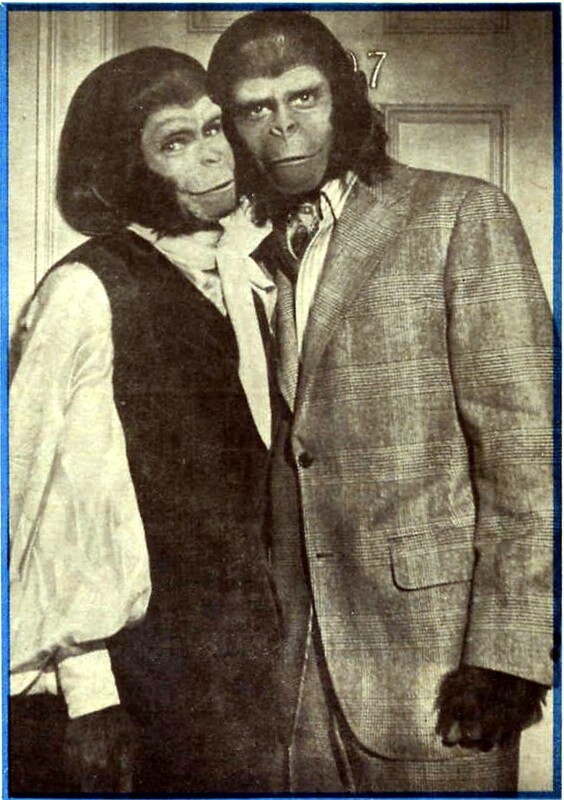 I didn’t see PLANET OF THE APES when it first came out. 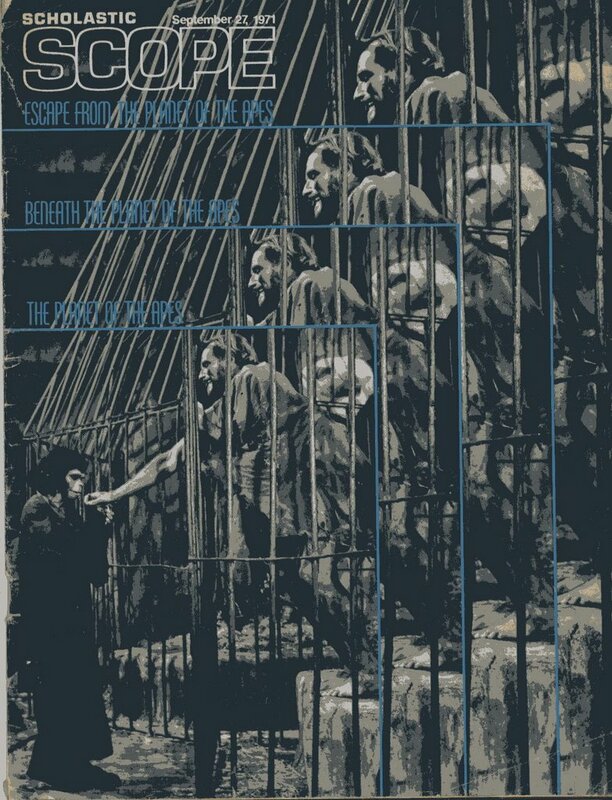 I did, however, catch a matinee of BENEATH THE PLANET OF THE APES (incongruously double-featured with BUTCH CASSIDY AND THE SUNDANCE KID) and from then on I was hooked. After ESCAPE FROM THE PLANET OF THE APES was released it quickly became my favorite (and the only one I still have on tape). Part of the reason I guess was that I got to play Cornelius in the adapted script we read out loud in English class out of this issue of SCHOLASTIC SCOPE. After that, Roddy McDowall became one of my favorite actors. 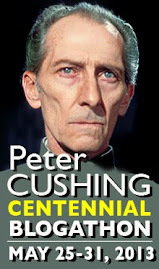 He was certainly easy enough to see in those days appearing extensively on television in COLUMBO, McCLOUD, NIGHT GALLERY and just about every third made for TV movie while still working regularly on the big-screen in non-Apes films such as THE POSEIDON ADVENTURE, ARNOLD and THE LEGEND OF HELL HOUSE. His early sixties flick, LORD LOVE A DUCK! became a real favorite. Anyway, my own family never went to the drive-in but when I saw all three Apes movies appearing on one drive-in show, I talked a friend into getting his mom to take us so I finally got to see the first one. The final two were still big deals to me but with diminishing returns. The masks that replaced much of the vaunted make-up from the earlier films made these last two entries looked cheap. The ensuing TV series was well done but seemed to ignore much of the film continuity. I enjoyed collecting the bubblegum cards more than watching the show (but I sold ‘em a couple years ago. Sorry ‘Fink) Star astronaut James Naughton would also later star in the first stage play I ever saw, a summer stock version of BUS STOP with Karen Valentine and Rose Marie. 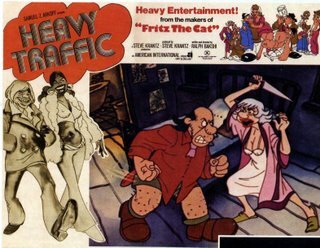 The follow-up cartoon series was so badly animated as to drive the final nail in the coffin of the franchise. Well, actually that probably came with the death of producer Arthur P. Jacobs who, prior to the film series was known mostly for his association with the late Marilyn Monroe. 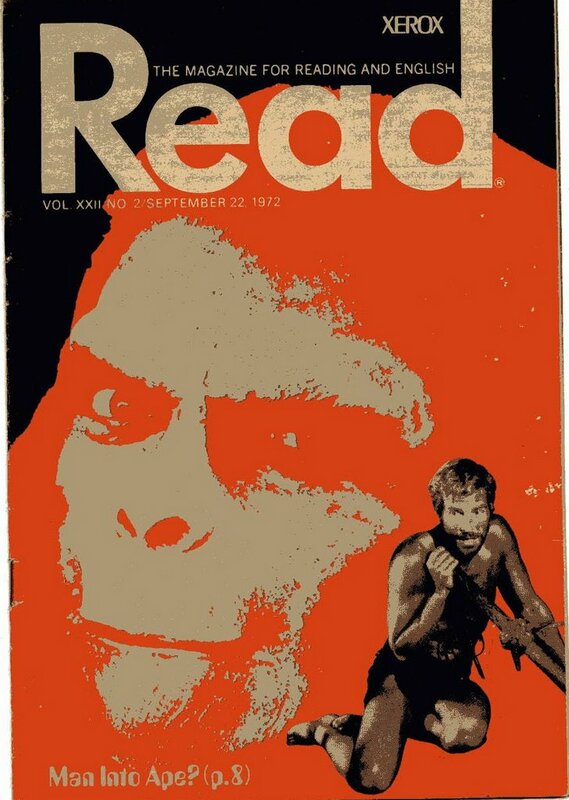 In the late seventies, I attended a "GO APE" marathon of all five PLANET OF THE APES movies. By the time the Tim Burton remake came out, though, my interest had waned and I passed. 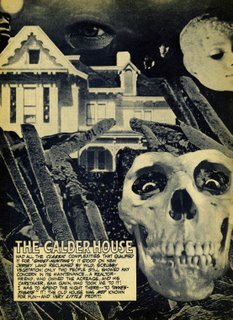 Roddy remained a favorite for the rest of his days and I still ctach the classic films when they turn up on TV but the DVD’s hold little interest. Sigh. In the end, I guess you’d have to say that the overexposure of APES was one of my earliest examples of overkill. I hate it when that happens. Now here's something interesting! SUPERMAN artist Wayne Boring on one of his rare BATMAN outings. This action-packed little gem was one of several giveaways from Kellogg's then-spanking new Pop-Tarts at the height of Batmania in 1966. 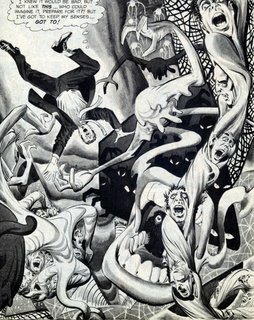 I've got a partial copy of another one somewhere but here, in its entirety, is BATMAN in THE MAD HATTER's HATE CRIMES! 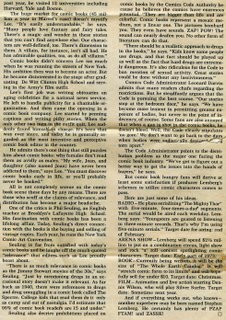 Here we have a rather long and rare September 1982 radio interview with Marvel Comics then Editor-in-Chief, Jim Shooter. 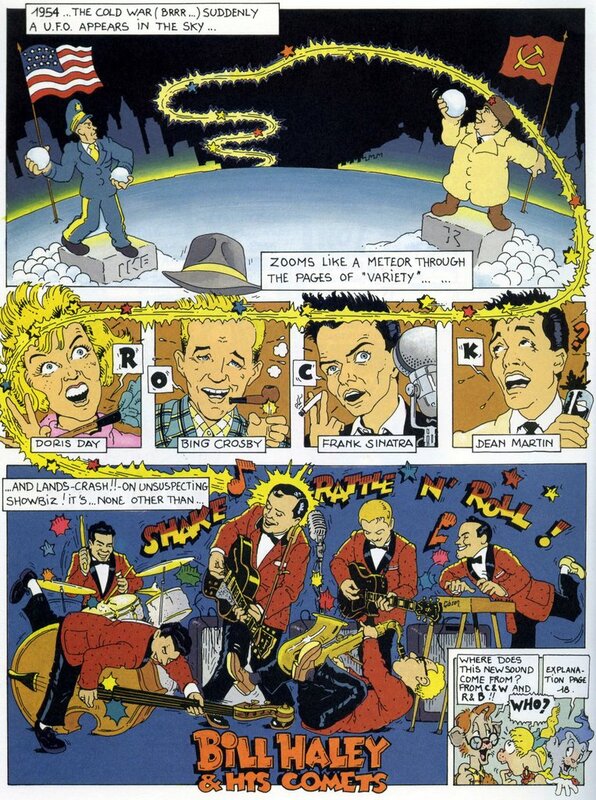 I sent a copy of the tape to Jon Cooke at COMIC BOOK ARTIST magazine a few years back but I couldn’t afford to keep up with the mag so I don’t know if he ever ran the interviews. Some background: As a regular subscriber to THE COMICS BUYERS GUIDE, I enjoyed future Eclipse Publisher Cat Yronwode’s column of news and opinions. There was a period around this time where Cat was incensed over persistent rumors that the controversial Shooter was planning a major overhaul of the Marvel Universe. 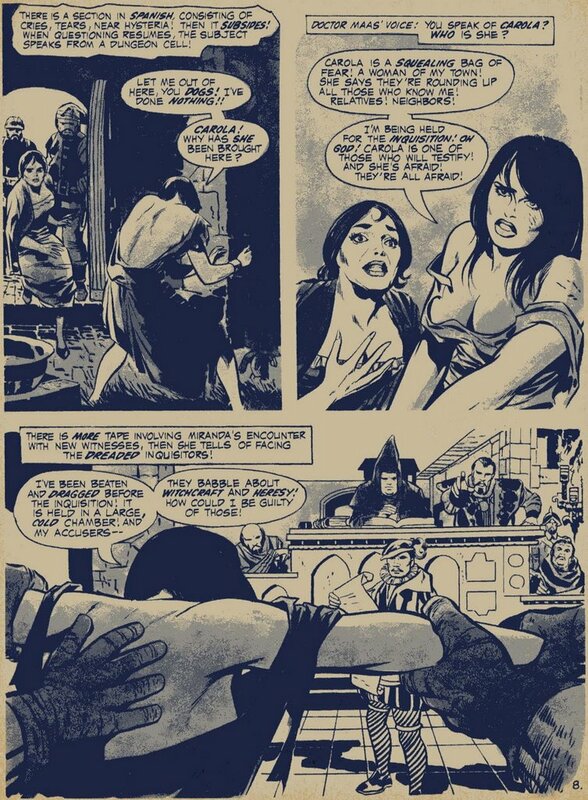 She was also reporting on Doug Moench’s departure from Marvel and particularly MASTER OF KUNG-FU, generally regarded in fan circles (and by me!) as one of the best written books of the period. I mentioned all of this during a phone conversation with my friend, Chris Barkley, a BNF (Big Name Fan) in sci-fi circles who just happened to have his own local radio show devoted to science-fiction and, on occasion, comics. 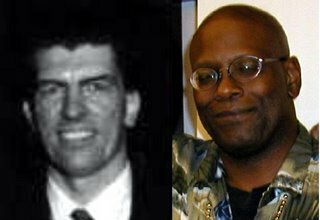 Chris arranged live phone interviews with Jim Shooter, Doug Moench and, the following week, Cat Yronwode. 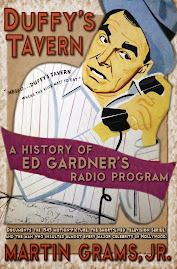 His show, BAD MOON RISING, was on a low power public radio station all the way to the left on the dial and was broadcast out of the basement of an old hotel. I’d be willing to bet money that very few people heard these interviews. Me, on the other hand? I taped them! The tapes have not weathered well and the sound is faster than it should be but I was able to transcribe Shooter’s pretty easily. I’m working on Moench’s, too, but Cat Yronwode’s is lost to the mists of time. The two times I met Shooter at Cons he was quite nice (if intimidatingly tall!) Here, he comes across as personable enough as he denies any and all rumors. It wasn’t long, however before he had replaced Iron Man and Captain America, just like the rumors said, and in fact, premiered his own New Universe. Was he lying, skirting the truth or did he just decide these were good ideas when he heard them? You decide! I’ve cleaned up the "uh’s" and "Umm’s" for the most part and I’ve eliminated a couple of listener "fanboy" questions but otherwise… Here’s the interview. By the way, that’s a relatively recent pic of Chris above next to a vintage shot of Shooter. Sorry there are no more illustrations accompanying this piece but the %^$#@!! thing just doesn’t seem to work right day! CB-This is Chris Barkley with another edition of BAD MOON RISING. Tonight is probably going to be one of the toughest shows I’ve ever done. 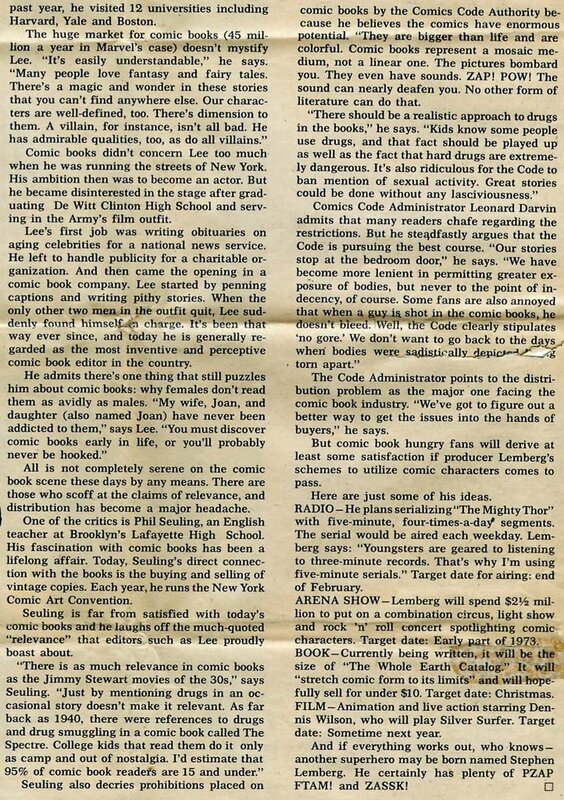 I have on the line here Jim Shooter, Editor (sic) of Marvel Comics and over the past month or two, there have been allegations as to whether he’s going to kill off certain characters, set up certain situations…and I felt it only fair to present this forum to all you listeners who like comics and to find out the truth of the situation… Now, why don’t I stop stalling and get on with the interview. Hello, Jim Shooter. CB-Before I say anything else, I wanted to thank you for agreeing to tonight’s call. I’m very nervous about this. 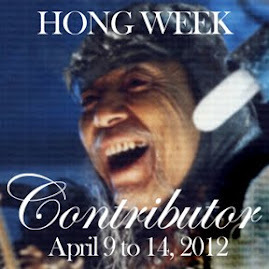 JS-Ha, ha! It’s my pleasure. CB-Okay, the first thing I’m going to do is ask you exactly how long you’ve been in comics and how you got into comics. 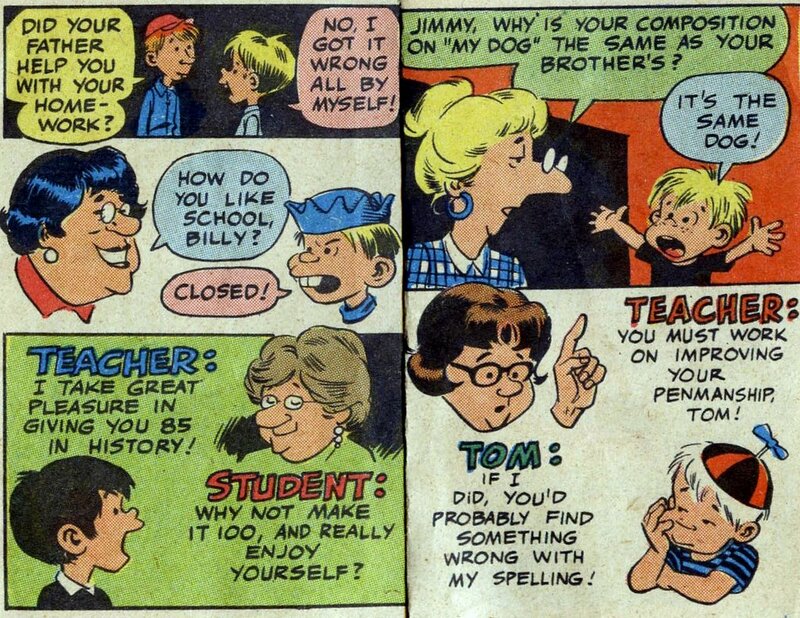 JS-Well, I’ve been in comics since 1965. 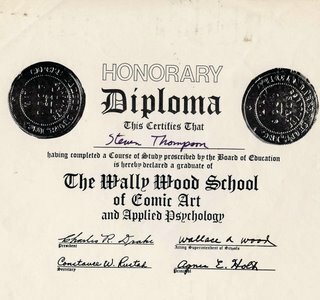 I got into comics because I needed money desperately and I thought of comics as a way to earn money ‘cause I was too young to get a real job. JS- Thirteen. So I sent in some scripts and DC Comics bought them and asked me to write for them on a regular basis so I did. CB-Which comics did you write for regularly at first? JS-Well, I started out with the Superman group, which was SUPERMAN, SUPERBOY, SUPERGIRL (in ACTION COMICS), Legion of Super-Heroes (in ADVENTURE), WORLD"S FINEST with Batman in it and uh…anything that the editor of Superman handled, I wrote. CB-Now, over the past maybe month, there have been allegations of you making certain changes in the Marvel line, mainly MASTER OFKUNG-FU, MOON KNIGHT, THOR and specific changes with CAPTAIN AMERICA, and IRON MAN. The talk is that you are going to kill off Tony Stark and Steve Rogers and have someone else replace those two. JS-Yeah, well, uh…None of that’s true. CB-At no time did you ever say that in front of anyone or even muse it? JS-No, no. What I said was, as a rhetorical example, I said that there are no sacred cows meaning that if some writer came to me with a brilliant plan to revamp or make Captain America exciting—more exciting—that it would be considered. I chose Captain America particularly because I thought that was probably the most extreme, unlikely example I could think of. Trying to demonstrate to one of our writers that he shouldn’t be fettered, he shouldn’t let his mind be shackled by imaginary constraints. CB-Was the writer in question Doug Moench? JS-Yeah. See, Doug was writing MASTER OF KUNG-FU and MASTER OF KUNG-FU, like every other Marvel book is doing pretty well. I mean, sales are going up steadily and anyone else would be real happy to have it but Marvel right now, everything is doing very well. MASTER OF KUNG-FU has been our third from the bottom book for years and I was approached by the editor of MASTER OF KUNG-FU, a fella who works for me directly who was unhappy with the way the book was going and felt that they were sort of in a rut and so I talked to him about it and I said by all means, if you can come up with some great new direction for it then go ahead. You shouldn’t feel constrained that there’s any particular rules that you have to be bound by so the editor approached Doug with what I thought was a great opportunity to create new things or make changes or do anything he wanted to try to y’know, to try to make it catch fire. And, apparently Doug wasn’t thrilled with that concept and I ended up talking with him. The editor gave up trying to convince him and asked me to talk to him so I talked to him and Doug felt that it was I guess just fine the way it was. What I was offering to him was an opportunity to just sort of go wild and create something exciting. We’d done that recently with DAREDEVIL and FANTASTIC FOUR where a writer…we just told him to look, don’t be afraid to do things and as a result we’ve seen dramatic new increases in the interest in those titles and that’s basically what I was looking for. I have no plans to kill off anybody. I have no plans to make any specific changes on any titles however in general I’m willing to listen to anybody who does. Basically there is no plan afoot and there never were to kill any…I have no plans or desire to make any changes with Captain America. I DID use those as rhetorical examples for what I was looking for in one title, our third from the bottom title and I’m still…If somebody comes to me and says hey, I’ve got a terrific idea, you’ll love it, it’ll make Thor wonderful. We’re gonna kill off the Asgardians. I’ll say, well, let me hear it. If it’s brilliant, who knows? But, uh…don’t hold your breath. CB-What do you see as the responsibility of the writer or an editor in this case? JS-Well, I think the editor’s responsibility is to …he is the guy who’s solely responsible for that book, whatever that book that he’s in charge of. He answers to me and I basically edit the editors. I feel that I’m responsible for the general priorities and very, very fundamental directions of the line mostly and the characters on a very broad basis and responsible for the cohesion of the universe because Marvel books all form one universe. I have to make sure they all inter-relate properly so the editor is basically in charge of the book and he works with his creative people to bring each title along. Each creative person’s input and effect on the book varies from individual to individual by how much they’re willing to take, how much responsibility they’re willing to take. I’ll give you an example. John Byrne for instance on the Fantastic Four, he likes to be left alone, he likes to carry the ball and essentially he’s doing terrific and basically we read his work and enjoy it. The same is true of Archie Goodwin when he wrote IRON MAN. He really didn’t need a lot of help and his work was sufficiently good that it really didn’t require a lot of correction so basically we knew well enough to let him alone. There are other writers—some of them are very good—who like to evolve things slowly and like to talk to a lot of people in the course of developing their stories and so forth. 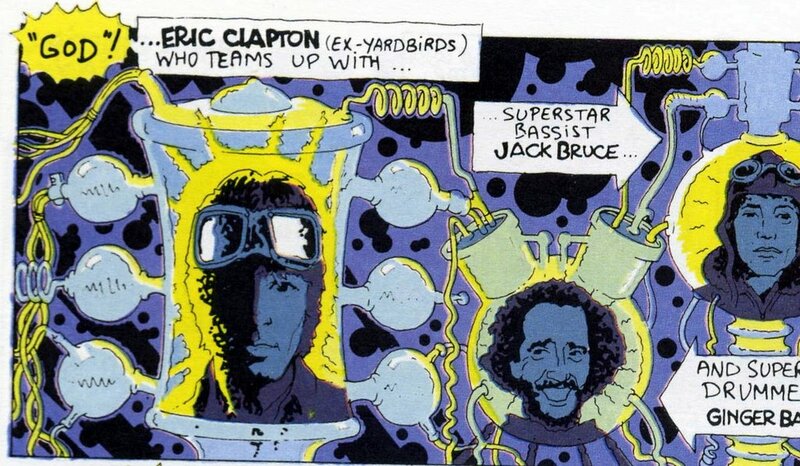 Chris Claremont for one. Chris will start talking about ideas for issues he has months and months and months in advance and bounce them off of a lot of people and get their reactions and so forth. He has a very organic relationship with his editor creating things and Chris is, you know, regarded by most people as kind of the number one guy in the business. CB-Uh-huh. A couple more questions I want to ask you. What about Bill Sienckewicz and Gene Day? I’m wondering why they left? JS- Well, Gene never left. Gene, unfortunately, died last week. CB-We’re talking about Gene Day? JS-Yes, of a heart attack but uh…at the point when he died he was still doing a regular series for us, THE FURTHER ADVENTURES OF INDIANA JONES and quite a lot of other work besides. I know that Gene, like many other guys, was doing some work on the outside for independent, smaller publishers and like that. CB-Working at Marvel in the near future though? CB-Why’d Frank Miller (leave) after such a successful run in Daredevil? JS-Frank…He was interested in developing one of his own characters and right about the time when we were starting out our Epic line of comics in which we buy limited rights to the creators’ own characters…we were in the process of talking with Frank on that and right about that time the publisher of DC Comics called him up and made him a firm offer on the spot and he thought it sounded pretty good and he agreed to it and he told me that he was gonna do a twelve issue series with them. There was no hard feelings or anything. It’s just that they gave an offer and he took it. As I understand it that was almost a year ago. I don’t think he’s signed a contract with them yet so I don’t know but in the meantime Frank has been, you know, coming around and talking with us and making plans to do things with us as well so if he eventually does go with a series at DC, I’m sure he’ll be back. If the negotiations fall through since they’ve been going on for a long time, then he’ll probably come and do that series for us and…whatever. I mean, he’s…We can’t own everybody. We want to have the best people we can and we try hard to get them but, you know, there’s gonna be some good people everywhere. CB- There’s also the question of George Perez, Gene Colan, Roy Thomas, Steve Englehart, Craig Russell, Marshall Rogers, Gil Kane, Ross Andru. Now do you feel that all these artists and writers going over to DC or smaller independent publishers will hurt Marvel? JS-Well, first of all, approximately half of those people you named work for Marvel more or less exclusively and if they left they didn’t leave …for any period of time…they didn’t leave while I was in charge. Craig Russell for instance has just done a graphic novel for us and has done a lot of jobs for MARVEL FANFARE. I don’t think Craig works exclusively for anyone. He sort of likes to shop around on a frequent basis. Steve Englehart as far as I know is working exclusively for us right now on one of our Epic comics. I can’t remember who else you named. JS- (sighs) Gene Colan (Shooter emphasizes the pronunciation as Co-LAN as opposed to Chris calling it CO-lun) and Roy Thomas. 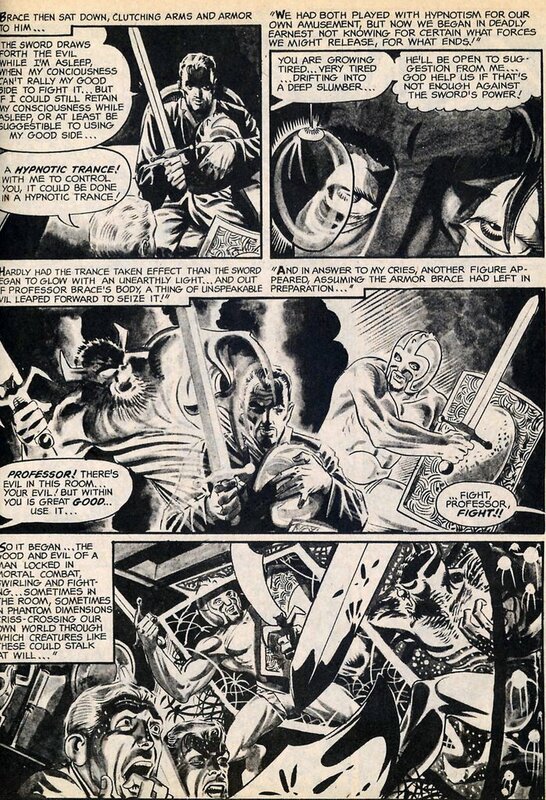 Um…Uhh…When Roy Thomas’s contract came up, he wanted things that…which we didn’t want to give him. Even though DC was not offering those things, he felt obliged to go over there because he couldn’t get what he wanted. Ummmm, Uh… same sort of thing with Marv Wolfman. Those guys both are very talented and they’re both very good. I think uh,,,like…uh, I think stylistically, uhh…they belong at DC. They’re…they’re…they’re…they kind of come from a different school than Stan and I come from and so that doesn’t bother me. I don’t think we’ve been hurt at all by that. In the meantime we’ve gotten from DC Al Milgrom, Larry Hama, Frank Miller for a good long time, Terry Austin, Dennis J. O’Neil, Denys Cowan, Dave Micheline, Bob Layton and the list goes on and on and on, I can’t think of it off the top of my head but the flow of people has pretty much generally been the other direction and the people who have left have more or less left with my blessing. George Perez left because he wanted all his life to draw the Justice League from when he was a little kid. He wrote me a very nice three page letter explaining that there was nothing against us and that he really felt we were fine but that he was given the chance to really sort of fulfill a childhood dream and he said he wanted to that for awhile and he’d probably be back. You know and we’d be up against that sort of thing and I don’t know what I should have done. As far as I’m concerned, right now creatively we’re stronger than we’ve ever been before. We have a terrific editorial team. We’ve got the people I want to have and uh… almost without exception and the proof of it is we are in the midst right now of our best year ever in our history. We’re up some phenomenal percentage in sales and the money we’re making and so forth and this is the best year in our history, better even than last which was the previous best year in our history, better than the year before that which was the previous best year in our history so I gotta figure we’re on a trend here, y’know? JS-Well, no. No, I have no plans to simplify if he means by that to make it sort of childlike or something. CB-I think he means eliminating some of the extraneous, sort of out-fringe stuff like Baron Strucker coming back every so often and Hydra and AIM…things like that. JS- Well, I’ve been plotting some stories with Tom DeFalco recently that use Hydra. I really think Hydra’s kind of a great concept. I think that…uh…No. I have no plans along those lines. You see, people run into a problem…If something is sophisticated, then it’s generally pretty easy to grasp. If its just complicated, then its usually pretty boring. I’m not in favor of things being complex for the sake of complexity but I’m also not out to take away the subtlety or the intricacy or the sophistication of anything we do. I think that’s an essential part of making it a real place. I don’t wanna simplify it if that’s what it means. I’m not at all interested in that. I want the Marvel Universe to work. I think it’s a valuable thing and I think we should protect it. CB-Why did you have to have Yellowjacket divorce the Wasp? JS-Well, it was the other way around. The Wasp divorced Yellowjacket. I saw that as…My question is, how could it NOT happen. I read everything those two characters ever appeared in and I went to the trouble of finding a psychiatrist and asking him about behavioral symptoms and so forth to check my storyline against practical experience. I felt that, considering the history of the Wasp and Yellowjacket, that it was kind of inevitable. Here we had a woman who was clearly very intelligent, very strong, very smart woman who clearly had been sort of suppressing herself and sublimating herself to this man who has ah an awful lot of on-panel mental difficulties. I saw…it’s a asituation where…Well, in the past she always flitted around his shoulder and flirted with him and teased him and he always said, "Not now. 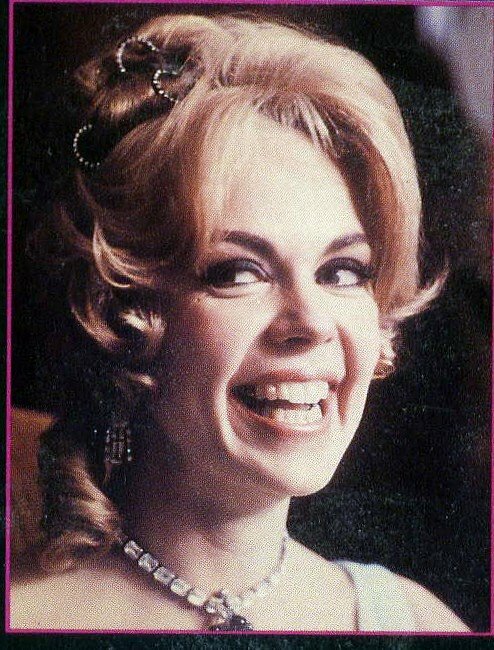 Can’t you be serious, Jan?" and uh…you know, she had everything. She was wealthy and smart and glamorous and heroic and so forth and even though he started out being a reknowned scientist and so forth, in the last how many stories he’s appeared in, I think very, very seldom was he the solution to any problem. I think the only thing he ever did of any note was to create the most horrendous villain the world had ever seen in the form of Ultron. This guy’s gotta have some serious self-doubts so I saw it as a volcano getting ready to explode. 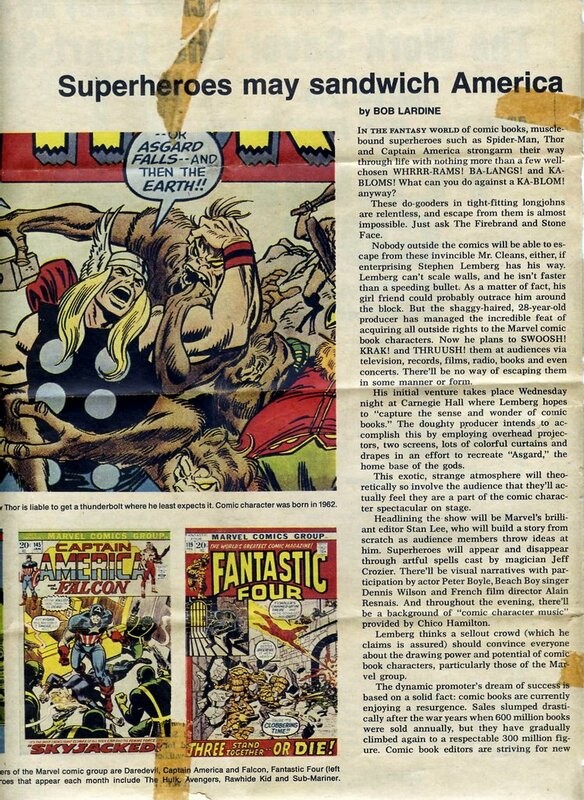 I started preparing for the story when I wrote my first AVENGERS story in 1976. I started laying groundwork for this to occur and I saw it as a very natural development of the characters. I think that…maybe…I’ve gotten a lot of mail to protest it but it’s been the kind of mail that expressed concern about the characters. "How can you let Yellowjacket suffer like this?" mail rather than "You’re a moron who can’t write." From what Stan tells me, that’s exactly the kind of mail that he used to get on SPIDER-MAN back when he did the…"How come Peter Parker can’t have a girlfriend?" rather than "You’re a moron and you can’t write" which tells me that the people care about the character which is what it’s all about. So that doesn’t bother me at all. I think we did real good. Besides I think people are going to be very pleased by issue 227 of the Avengers where there’s some real significant developments with Yellowjacket and the Wasp. CB-Okay. Let’s see. A couple of questions about Bob Layton. What happened to Bob Layton and if Steve Ditko’s style is low quantity when will Bob Layton do Iron Man? JS-Well, Steve did one fill-in issue of IRON MAN and Steve’s style is kind of a style that a lot of people aren’t real interested in these days although he’s really one of the all-time greats of comics. But styles go in and out of vogue so I kind sort of understand if people aren’t interested in the look that he has. Steve’s not doing a whole lot of stuff for us although, as far as I’m concerned, since he’s one of the guys that created Spider-Man, he can come work for us anytime. CB-You wrote for Legion of Super-Heroes. Any idea to get Mike Grell and why do some artists work exclusively ? JS-Well, it comes down to personal taste. I mean, we’d like all of the best guys to be exclusive to us. 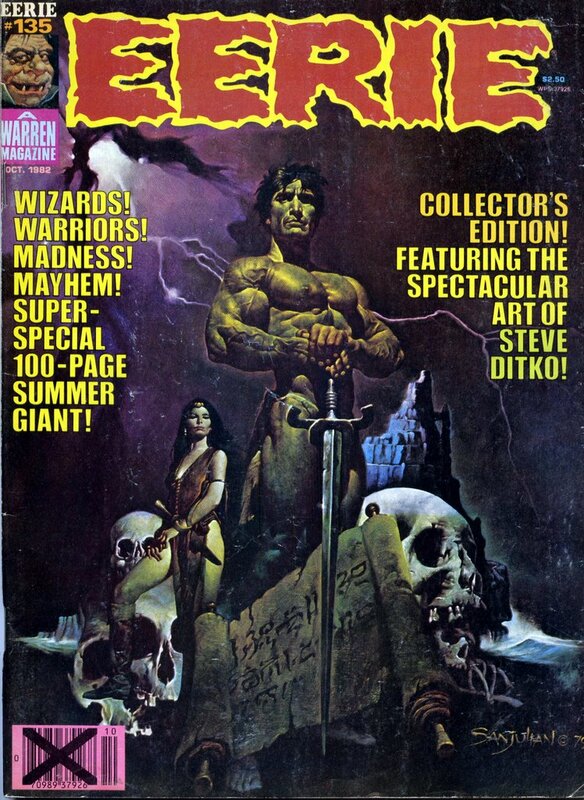 Yes, we’ve talked to Mike Grell many times. Mike has got so many projects going. He’s always said yes he’d love to work for us but he’s gotta get this, this, this, this and this done first and by that time something else comes up so I expect sooner or later, he’ll get around to doing a job for us but there are just some guys who kind of like to play the field and can’t get settled at one company or another. That’s okay. JS-Okay, the first Epic comic will be published in October. It’s DREADSTAR by Jim Starlin, all-new, all-original featuring characters which he did in Epic Magazine and it’ll be bi-monthly after that. The second series, the first issue goes on sale in January and that’s COYOTE by Steve Englehart and Steve Leailoha. There’ll be more but that’s all we have so far. CB-When will Chris Claremont end the Brood story in X-Men? JS-I believe in the next issue that’ll be on the stands. The one that’s on sale in November. A dramatic conclusion. CB-The last question I want to ask you…THE CINCINNATI ENQUIRER, the paper here, has an editor who may have a specific gripe against you because they took a swipe at the Pope John Paul II comic that will hit the stands Monday…Tuesday…and they said it was atrocious but as far as I know they don’t have a copy. How do you respond to people like that who don’t know anything about comics and take a swipe at things they don’t understand? JS-Well, ignorance has never stopped people from attacking things. All I can tell you is that we did the best we could with it and that the Pope saw the drawings and pronounced them good (laughs). That’s good enough for me. I think the overwhelming response we’ve gotten has been positive. 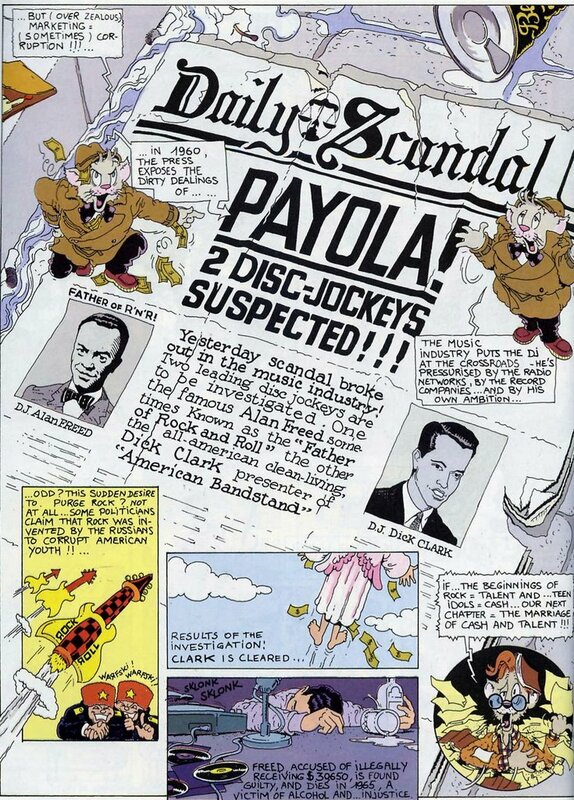 This is the first comic book that I ever remember certainly and as far as I know in comic book history that the wholesalers across the country have come to us and asked us for. Usually they just take the comics and really kinda don’t care too much but we have had them calling constantly and asking us to make sure that they get enough copies and so forth. This was done more or less at the request of the Pope and the Pope’s people and working with his biographer, Father Melinski who has been the Pope’s friend since childhood so let ‘em take swipes at us. We did the best we could. CB-Okay. 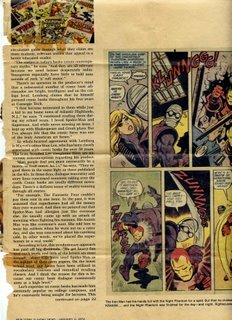 Jim Shooter, editor-in-chief of Marvel Comics, thank you very much for agreeing to this interview and explaining your side to it. Thank you very much. Before Jim Shooter left Marvel in disgrace a few years later he created SECRET WARS, my personal candidate for all-time worst major comics project. 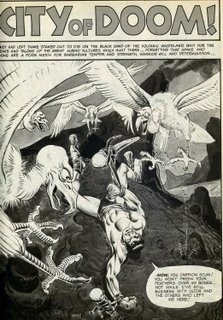 He then soared brightly if briefly with Valiant Comics, failed at a couple attempts to buy Marvel, made a good effort with Defiant Comics, failed with Broadway Comics and is now listed as part of Phobos Entertainment. 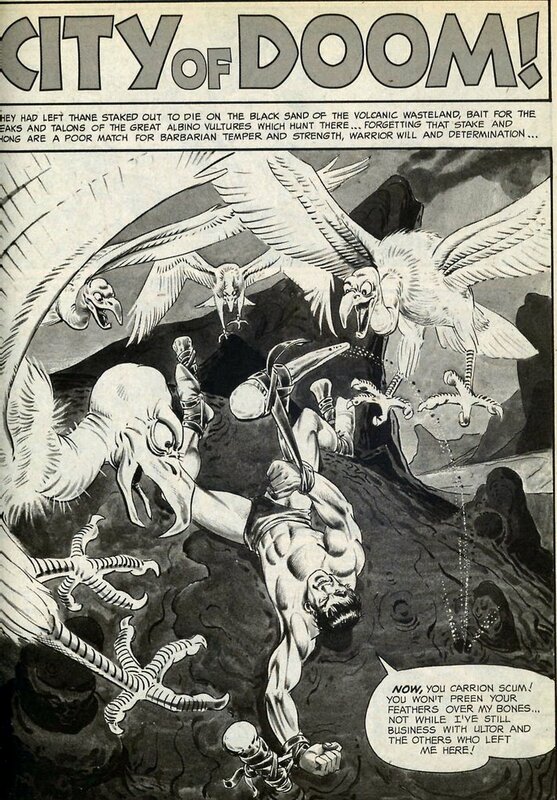 A preview of Stan Lee’s then-upcoming Carnegie Hall appearance which would employ "overhead projectors, two screens, lots of colorful curtains and drapes in an effort to recreate ‘Asgard,’ the home base of the gods." Dennis Wilson IS the SILVER SURFER! Well, maybe not. Did Dennis KNOW he was supposed to be in a Marvel movie? Was the fact that he was the only surfer in the Beach Boys the reason he was cast? Was there a script or was this somebody’s pipe dream? Did they SEE TWO-LANE BLACKTOP???!! The book. What did this grandiose sounding tome that would "stretch comic form to its limits" and still sell for under ten bucks turn out to be? 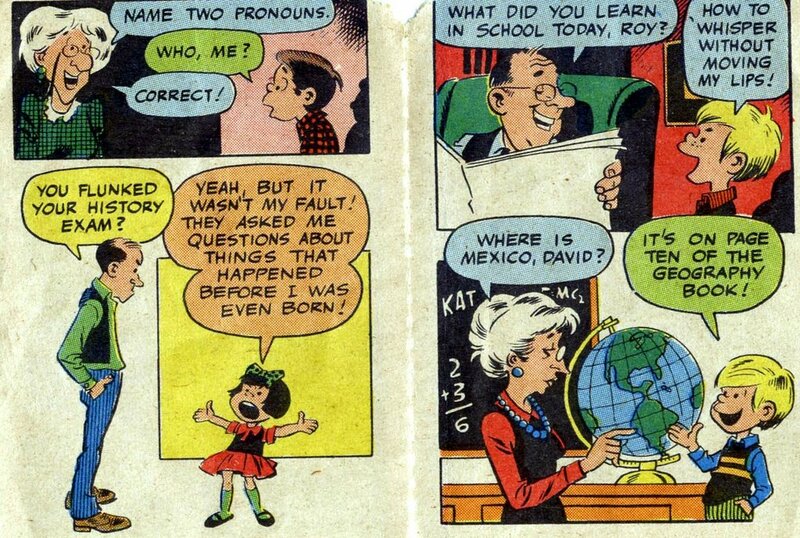 ORIGINS OF MARVEL COMICS? 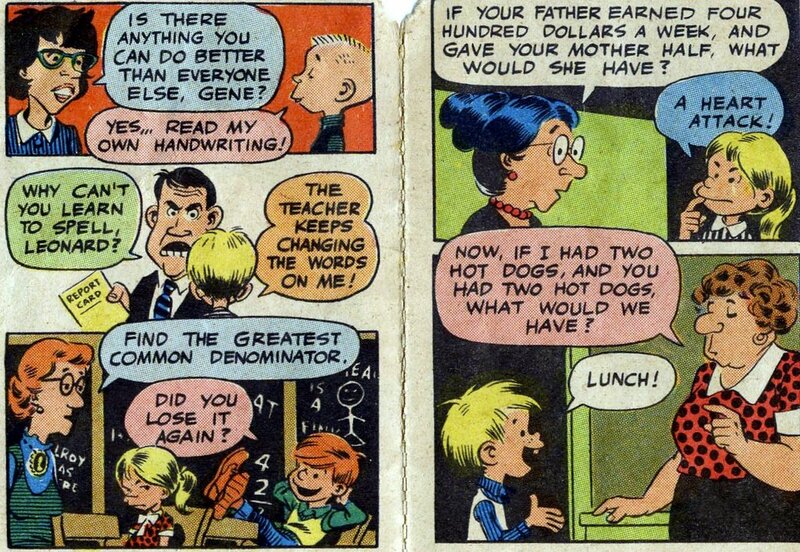 THOR on radio in little five minute serialized versions. Well, it was a few years later and it was FANTASTIC FOUR (with Bill Murray as the Torch!) but this one DID come true! It’s just that most markets didn’t carry it and in those that did, audiences really didn’t care. Sigh. All in all, an interesting article. My favorite line is when the writer says "These do-gooders in tight-fitting longjohns are relentless, and escape from them is impossible. Just ask the Firebrand and Stone-Face." Has this guy ever read a comic book or did he just pick up the couple current issues Marvel sent over and cite two of the most obscure villains ever? 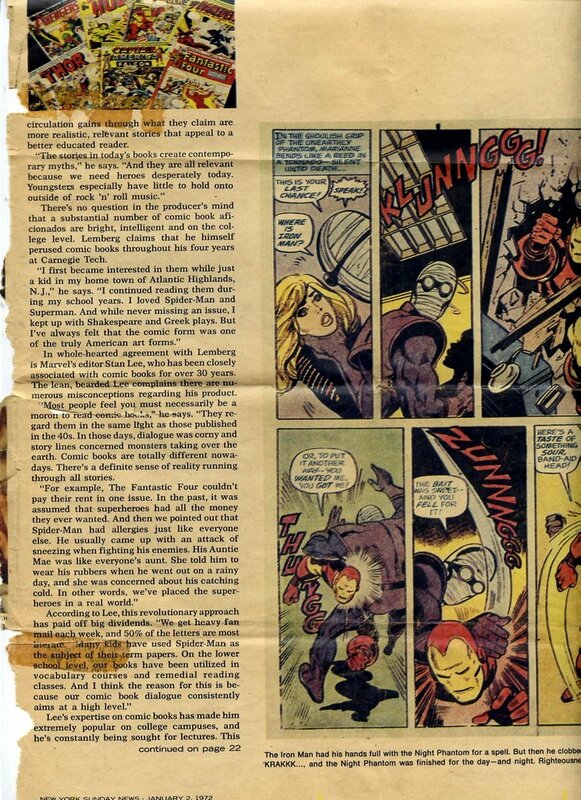 Howzabout "Just ask Doc Doom and the Red Skull?," "...Baron Zemo and Ultron Five?," "...Magneto and Titanium Man!!??" AAARRGGHH!!! By the way, were any of my readers at the Carnegie Hall show? If so, how was it? 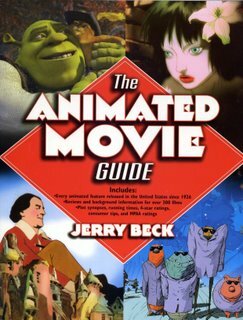 Fellow blogger Jerry Beck recently came out with THE ANIMATED MOVIE GUIDE and I have to say I think it’s indispensable to any animation researcher. 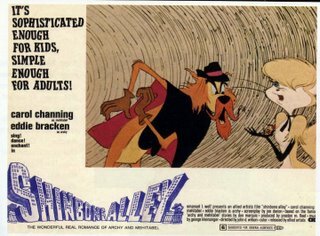 Over the years, Jerry has developed a solid reputation as a cartoon historian , validated by his appearances on the Looney Tunes and Disney DVD’s. This book brings together capsule reviews of every animated feature released in the United States along with cast and crew information. I’m not that fond of the cover. The design is nice, the choices fairly logical and the colors are pretty. There’s nothing bad about it at all but for some reason, it seems to render the book invisible to me. When I first saw it on the shelf, I looked past it several times before recognizing it. 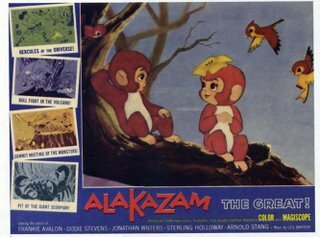 On the inside, many of the reviews are illustrated with small black and white still shots but there’s a really cool color section in the center made up mostly of rare lobby cards, some of which I’ve posted here. One of the first things I do with any book like this is to look up favorite and/or obscure items I’m familiar with to see if they’re present. It took me a minute to find KIKI’S DELIVERY SERVICE, one of my all-time favorite animated features, but that turns out to be because Jerry has logically segregated features that didn’t receive actual theatrical release. SHAME OF THE JUNGLE was right where it should be (The American version of this European Tarzan parody could be termed the first SATURDAY NIGHT LIVE movie, featuring as it does the voices of John Belushi, Bill Murray, Christopher Guest and Brian Doyle Murray). ALAKAZAM THE GREAT!, an early fave of mine and one of the first animated Japanese features to be released in this country was present and accounted for as was THE MAN FROM BUTTON WILLOW and SHINBONE ALLEY. I did NOT find any mention of THE WEIRD ADVENTURES OF MUTT AND JEFF AND BUGOFF, the cold war spy spoof that my friend Derek Tague and I had just been discussing. Let’s not be picky, though. What IS in this book is a nearly perfect blend of facts, reviews and trivia that ultimately tells the tale of feature length animation one picture at a time. Not to pat myself on the back but I knew quite a bit about animated features going in to this tome but I learned a heck of a lot more before I finished it. Bravo, Mr. Beck!